The Northern Ireland Human Rights Commission enjoyed a very successful visit to Newry and Downpatrick on Monday, to engage with local representatives and organisations. 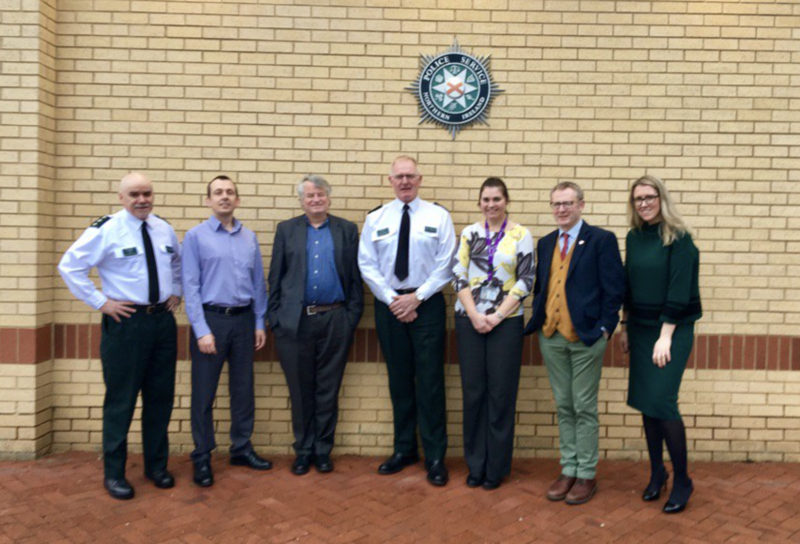 Chief Commissioner, Les Allamby, attended meetings with Commissioners, Marion Reynolds, Christine Collins and Alan McBride, as part of the Commission’s ongoing community engagement programme. The visit began with a meeting with Superintendent Paul Reid, the District Commander for Newry, Mourne & Down. This was attended by the Superintendent’s senior management team and local officers, who briefed the Commission on the issues being faced by the local police service. Commissioners also met with local community groups at Downshire Civic Centre. Among the groups present were Citizens Advice Bureau, Space NI, NI Housing Community Network, Mulholland Aftercare Services, Public Initiative for the Prevention of Suicide & Self-Harm, Downe & Daisy Hill Hospital Campaigns, Harmony Community Trust/Glebe House and representatives from the local ethnic minority community. Following the meeting, Commissioners met with Councillors of Newry, Mourne & Down District Council, where they were welcomed by the Chair, Gillian Fitzpatrick. The meeting covered a diverse range of issues, including the potential impact of Brexit, the rights of ex-prisoners and their ability to access work and travel, and the importance of protecting victims’ rights. The vulnerability of migrants in Northern Ireland was also raised. After hearing from Councillors, Commissioners briefed attendees on the current work of the Human Rights Commission - highlighting the legal clinic that is open to the public every Wednesday; the Commission’s ongoing investigation into traveller accommodation; and its commitment to promoting and protecting the rights of everyone in Northern Ireland.